The latest issue of JAMA has a paper on a “portfolio” of dietary means to reduce blood cholesterol levels. The paper is likely to get lots of press because it concludes that consuming the “portfolio”—a combination of plant sterols, soy protein, viscous fibers, and nuts—does a better job of lowering LDL-cholesterol (the “bad” kind) than does dietary advice to reduce saturated fat. The paper is unusually difficult to read (see the Abstract, for example). But besides that, I interpret the study in part as a drug trial. One look at the Abstract and I immediately suspected that this study must have been sponsored by a maker of plant sterol margarines. Plant sterols are well established to reduce blood cholesterol levels. Unilever, which makes Take Control margarines, is one of the sponsors. Advising people who weigh an average of 76 kg (167 pounds) to consume a healthy diet doesn’t work. Study subjects did not change their diets by much during the six months of the trial. No news here. Advising people to add things to their diets has a better chance of succeeding than advising taking things away (like saturated fat). All of the portfolio items have been established to lower blood cholesterol in clinical trials, although the evidence for soy protein seems a bit iffy these days. The study does not distinguish between the relative effects of soy protein, fiber, or cholesterol lowering margarines. If soy is eliminated, that leaves fiber and margarines. I’m guessing the margarines were the critical factor. Hence: a partial drug trial. 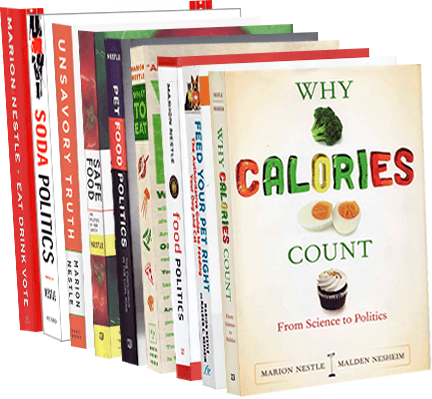 And because my book on calories is coming out next March, I must point out that the study groups reported losing losing small amounts of weight, which means they must also have reduced their calorie intake. Weight loss alone should help with blood cholesterol. The take-home message: if you really do substitute nuts, sources of fiber, and healthy foods for whatever less healthful foods you used to eat, you ought to get some health benefit, with or without plant sterol margarines. QED: Healthy diets produce health benefits. It’s always nice to see that confirmed. The FDA has its hands full these days, what with peanut butter, no commissioner, and Daschle withdrawing for consideration as secretary of Health and Human Services (the FDA’s parent agency). Even so, the FDA is concerned about weight loss supplements that it considers fraudulent, and has now gone after 70 of them. The FDA has a lot on its plate, as it were, and let’s hope the new administration figures out a way to make oversight of the food supply a priority. February 10 update: the New York Times has a long piece on this problem. Turns out that a lot of these so-called herbal products actually contain weight loss drugs of one kind or another. They are not supposed to. Glaxo, the company that makes Alli (a.k.a. Xenical), says it has sold 2 million packages of the diet drug since June when the FDA approved over-the-counter sales. How did Glaxo do this? In interesting ways, says the Wall Street Journal. The New York Times says the company says 70% of people taking the drug say they are losing weight. Maybe so, but under some coercion. Eat too much fat while taking the drug and you can expect some messy side effects. There has to be a better way….